Sociopathy -- more correctly called anti-social personality disorder, according to the MedlinePlus website -- is a destructive and dysfunctional chronic mental condition. Sociopaths, as those individuals who have anti-social personality disorder are called, treat others callously, have no regard for right and wrong and often have problems with drug and alcohol abuse, according to staff writers at the Mayo Clinic website. Symptoms of sociopathy often begin in childhood and may also be seen during the teen years. Anti-social personality disorder is probably the result of interactions between genetics and environment, according to MayoClinic writers. The condition cannot be officially diagnosed until a teenager has reached the age of 18, according to the American Academy of Pediatrics, but the symptoms are often present before the age of 15, and part of the diagnostic criteria is that symptoms were present from at least age 15. 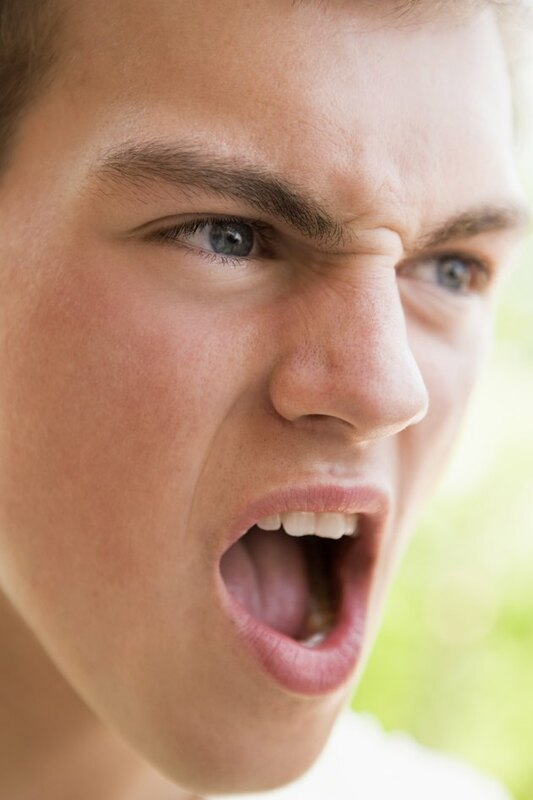 Although some teens who grow up in abusive or neglectful environments might display some of the signs of sociopathy, they are not considered true sociopaths. Risk factors for the condition include a diagnosis of childhood conduct disorder, which includes repeated instances of behavior such as lying, stealing, bullying and being physically cruel to people or animals, according to the American Academy of Child and Adolescent Psychiatry. Other risk factors are a family history of mental illness, personality disorders or sociopathy, being subjected to verbal, physical or sexual abuse as a child, the loss of parents through a traumatic divorce while still a child, an unstable or chaotic family life and a history of substance abuse in parents or other family members. One of the first signs of sociopathy might be a lack of empathy, according to the Mayo Clinic website. Cruelty to animals, especially in childhood, might be another early sign. Other symptoms include a disregard for right and wrong, persistent lying to exploit other people, manipulating others with wit or charm for personal gain or pleasure, recurring difficulties with the law, hostility, significant irritability, impulsiveness, aggression or violence. A sociopath typically shows no remorse for hurting others, breaking the law or causing damage. Teens who have anti-social personality disorder might experience a number of negative consequences. Their aggressiveness can lead to verbal and physical violence or fights with others, gang participation, reckless behavior -- including risky sexual behavior, alcohol or substance abuse -- gambling problems, occasional periods of depression and anxiety and problems in school and at work. Sociopaths often have relationship difficulties, both within their families and with friends or coworkers. They are also likely to be incarcerated because they break the law. Although teens with anti-social personality disorder need treatment, the condition is very difficult to treat, especially since the diagnosis cannot be made until the individual is at least 18 years old. Sociopaths may also need treatment for substance abuse disorders, depression and anxiety, according to the MedlinePlus website. Psychotherapy and medications are sometimes used in treatment, although the Mayo Clinic website notes that therapy is unlikely to be effective when symptoms are severe and the individual has little insight. Although medications can be prescribed for some of the symptoms of anti-social personality disorder, such as depression or anxiety, there is always a risk of substance abuse. What Are the Psychological Causes of Bedwetting? What Are the Treatments for a Sociopath?